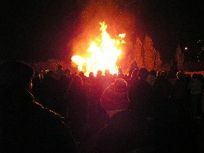 There is no law restricting times when you can have a domestic garden bonfire, but it is important to think about your neighbours and other local residents. The Council can take action where smoke from bonfires is causing a statutory nuisance. Just because you can see a garden bonfire or smell smoke does not make it a nuisance - to be a nuisance it must be unreasonably affecting your use or enjoyment of your property. Issues that can play a part in deciding whether it is a nuisance include the size of the fire, the materials being burnt, the weather and the smell. If the Council is satisfied there is a nuisance, then a legal notice will be served to prevent any further nuisances. If nuisances continue and are proved beyond all reasonable doubt then the person responsible may be prosecuted in a Magistrates' Court and fined up to £5,000. Never have bonfires at weekends or on bank holidays when people are more likely to be enjoying their gardens - be considerate! Do not allow bonfire smoke to blow over a road - this is an offence under the Highways Act 1980. Avoid burning when air pollution in your area is high or very high. This information is included in weather forecasts or on the UK Air Quality Archive website. To make a complaint report a smoke nuisance using our online form.